● Started fifth and finished second. ● A caution on lap one resulted in a quick stop in the action. Busch was in sixth place. Green-flag racing resumed a few laps later and Busch settled into a comfortable pace. ● The iK9 driver got up to third place by lap 15 and was in second by the end of Stage 1. ● Busch was pleased with the handling of his No. 18 iK9 Toyota Supra, so the team elected to only change four tires and add fuel. Quick pit work allowed Busch to exit pit road in first place to begin the second stage. ● Started first and finished fourth. ● Stage 2 started off with a handful of cautions. Busch maintained the lead until green-flag racing resumed in earnest. He lost the lead on lap 71 to Tyler Reddick and then settled into the third position. ● The caution flag waved on lap 81 and Busch reported that his iK9 Toyota was too tight getting into the turns, but would then get loose in the center of the corner. The team used the opportunity to pit, making air pressure adjustments, changing four tires and adding fuel. Busch exited pit road first, but a handful of cars stayed out, placing Busch fourth for the lap-88 restart. ● Busch battled during the final laps of Stage 2, but settled for fourth place to complete the stage. ● Started second and finished first. ● When the stage began, Busch worked to regain control of the lead, but eventually found a steady pace in third place. He quietly logged laps until the caution flag waved on lap 127. He reported that his car lacked the grip it needed. ● The iK9 team made a slight chassis adjustment, a minor air pressure adjustment, changed four tires and added fuel during the caution. Busch came to pit road in third place and maintained the position through the round of pit stops. ● Green-flag racing resumed on lap 132 and was quickly followed by a caution on lap 134 for an accident that unfolded directly behind the iK9 Toyota Supra. Crew chief Ben Beshore implored Busch to save fuel. ● The race restated on lap 140. A suddenly ill-handling iK9 Toyota Supra sent Busch back to ninth by lap 143. Despite this, Busch dug in and worked his way back through the field, cracking the top-five by lap 160 and grabbing third by lap 165. Busch reported that his car was still a little tight in the turns. ● Caution was displayed for a stalled car on pit road on lap 190. Busch was in third place. ● Needing a little more fuel to make it to the end of the race, Busch made a trip to pit road for a splash of gas. He was able to win the race off pit road and lined up in second place for the lap-195 restart. ● Busch jumped out to the lead during the final restart and held onto the top spot to score his third Xfinity Series win of 2019. 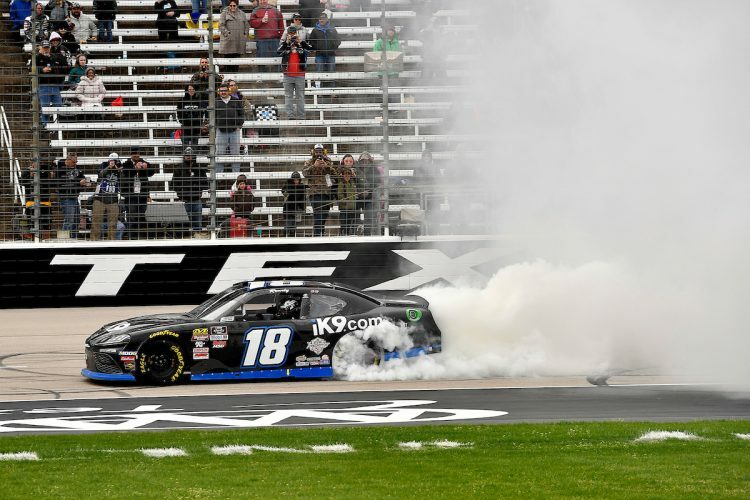 ● This was Busch’s 95th career Xfinity Series victory, his third of the season and his ninth at Texas. His margin of victory over second-place Tyler Reddick was .861 of a second. ● Busch has won three out of the four Xfinity Series races he has entered this season. His lone, non-winning finish was a second-place result March 16 at Auto Club Speedway in Fontana, California. Busch’s average Xfinity Series finish this year is 1.25. ● Busch led three times for 33 laps in the My Bariatric Solutions 300. ● The No. 18 iK9 team remained first in the owners’ championship with 292 points. It holds a 24-point advantage over the No. 2 team of Richard Childress Racing. ● There were nine caution periods for a total of 50 laps in the My Bariatric Solutions 300.